Tall Wooden Buildings, Will Building Codes Allow Them? Home | Product Developments | Tall Wooden Buildings, Will Building Codes Allow Them? Last week, we took a first step into the world of tall wooden buildings by comparing the living tree towers of the Wookiee homeworld Kashyyyk to the wood-framed skyscrapers many architects and engineers say can be the key to solving climate change and making buildings carbon neutral. But even if all skyscrapers were designed using wood instead of steel and concrete, would any major city allow them to be built? Building codes are sets of regulations governing the design, construction, alteration and maintenance of structures. They specify the minimum requirements to adequately safeguard the health, safety and welfare of building occupants. 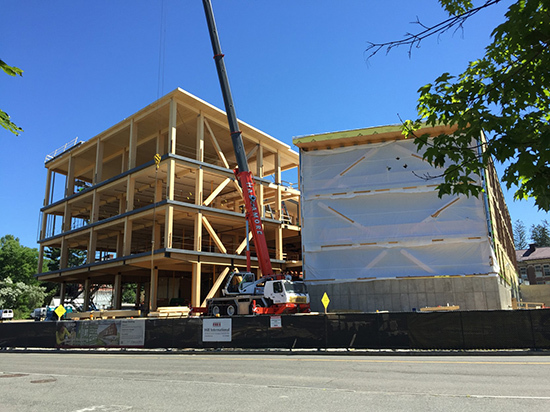 The CLT frame of the Design Building at UMass-Amherst. Image courtesy of Leers Weinzapfel Associates. Some building codes are specifically written with the geographic challenges of the region in mind. The Miami-Dade County building code calls for stringent hurricane-proofing, including walls and windows that can take the impact of a two-by-four shot at 40-mph. Depending on proximity to the San Andreas fault, most California building codes require the resilience of steel and concrete for tall buildings due to potential loss of life and damage from earthquakes. When the three-day Great Chicago Fire killed 300 people and destroyed 17,500 wooden buildings it effectively ended wooden construction in the Second City for good, paving the way for the advent of the steel-framed skyscraper. The Home Insurance Building became the nation’s first steel “skyscraper” 13 years after the fire. Flash forward to 2001 and the steel frames of the World Trade Center saved the lives of thousands of workers in the lower floors of the towers on 9/11 by standing long enough to allow them to evacuate, despite the the inferno created by purposely crashed airplanes raging above. While wood can provide resiliency and slower burning times thanks to glulam timbers and using slow-burning species of tree, can building codes even consider wood in the face of natural disaster or terrorism? Design Building Rendering courtesy of Leers Weinzapfel Associates. In the name of sustainability, codes, themselves, are already moving toward greater acceptance for larger wood structures, but not necessarily for structural mass-timber skyscrapers. Buildings with light wood framing of up to six stories, with up to four occupancy groups at each level, are allowable under the height and area prescriptive language of the 2012 International Building Code from the International Code Council. The ICC is a nice guideline, but most large cities in the U.S. only use it sparingly because of the aforementioned regional differences. Yet, the push for tall wooden building will continue. Architects, engineers and construction companies from around the world submitted projects for a $2 million purse in the Department of Agriculture’s U.S. Tall Wood Prize Competition. 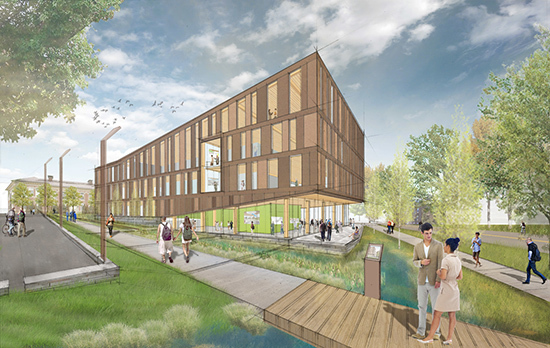 Soon, the University of Massachusetts-Amherst will complete the $52 million Design Building, the first of its size in the U.S. to feature cross-laminated timber, (CLTs), which are used as part of a composite wood-concrete floor assembly. A “zipper truss” system of both steel and wood spans the two-story high building commons space. The heavy timber structural members have steel connections. It’s scheduled for completion next month. Design architect Leers Weinzapfel Associates and construction manager Suffolk Construction vouch for its safety and resiliency. It could be to CLTs what the Home Insurance Building was to steel frames.